In our own journey to the cloud here at Microsoft, IT learned a lot about the challenges and strategies that make for a successful migration. Our internal “First and Best” rule, which holds that any Microsoft release must first be deployed and tested within an enterprise environment, provides valuable lessons for both partners and customers. The journey began with the formation of a Cloud Strategy Team whose task was to lead the analysis and experimentation phase, and build the architectures and guidance for deploying the new cloud apps and services. With the team in place, we soon realized our own cloud migration strategy had to evolve. In this video, software engineering manager Brad Wright (aka “the cloud guy”) describes how he told a group of IT pros they would soon be out of the datacenter business. The pros were skeptical, but five years later Microsoft has shut down several data-centers and operates almost completely in the cloud. Here are three key lessons learned from Microsoft IT’s cloud migration. As we moved to the cloud, Microsoft’s overriding vision also evolved. It quickly became clear that some apps were not yet ready for the cloud and would still have to run in traditional datacenters, resulting in a hybrid cloud configuration. Commoditized services (about 15 percent of the portfolio) such as Microsoft Dynamics CRM Online, SharePoint, and email were delivered through software as a service (SaaS). Applications with planned investments used Azure platform as a service (PaaS). 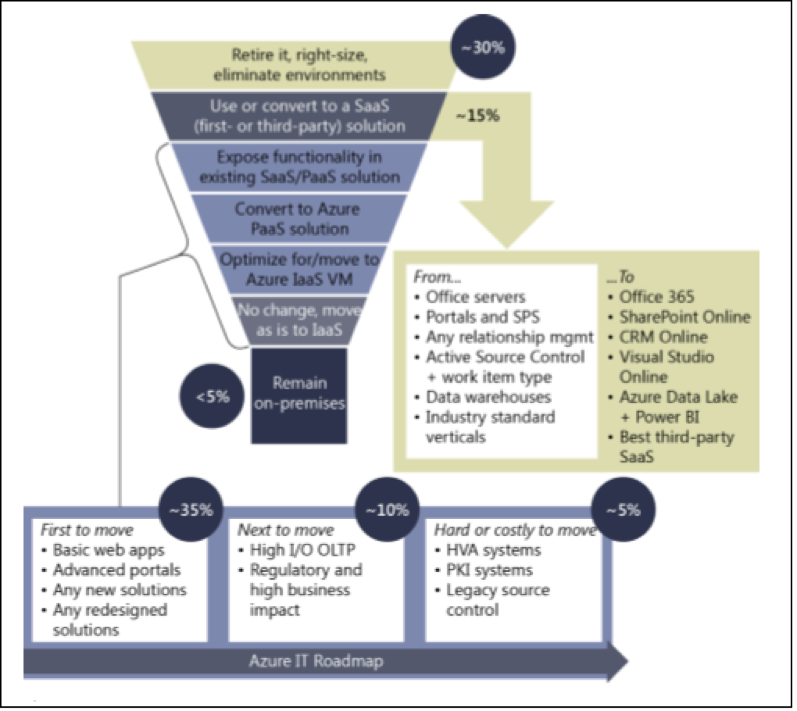 Existing apps with no planned investment were moved to Azure infrastructure as a service (IaaS). Existing applications with regulatory compliance requirements and not available in a public cloud solution were used on the on-premises private cloud. Back in 2011, Microsoft IT was managing around 2,100 line-of-business applications and about half of those were custom-built. These were identified as “first to move.” Most existing applications were slated to move to IaaS virtual machines (VMs). The rationalization exercise determined about 30 percent of the portfolio could be retired, right-sized, or eliminated, which also eliminated thousands of servers and VMs. Microsoft initially weighed two factors to determine when an application would be targeted for migration: the technical complexity of the move and the business impact. We started with the least complex apps that had the least impact on business. This allowed the engineering teams to build the initial architecture models and up their cloud skills with limited risk. New applications and major releases were slated for redesign as PaaS apps. The structure of the workforce also evolved quickly. With decentralized infrastructure, we no longer needed armies of datacenter personnel on premises and those roles changed to focus on more high-value business contributions. With the ability to deploy apps quickly and repeatedly using agile methodologies, the cloud migration naturally brought together the development and operations communities within Microsoft. This new discipline, called DevOps, allows developers the unique opportunity to test their apps in staging areas in the cloud. Operations personnel spend less time managing hardware servers and networks, and more time creating automated configuration, deployment, and monitoring scripts. Microsoft IT leaders let engineers experiment in this new space, supporting them as they envisioned the art of the possible and created new solutions. This creativity is a cornerstone of the cloud migration journey. What lessons have you learned in your own cloud migration journey? Share your thoughts with the Microsoft Partner Community here.